For over 13 years now we have been designing, building and providing the very best products for your SpecMiata. We can provide individual parts from the roll cage kit all the way to build packages with everything needed to convert a street Miata in to a SpecMiata, or even provide you with a turn key race ready built car. We now have parts and a complete cage kit for the 2006-2015 MX5 cars, and are currently working on the 2016+ ND model Mazda Miata. Simply the very best custom roll cage kit for your Miata! For over 13 years now and over 1300 kits sold we have been the leading supplier of custom roll cage kits for the SpecMiata community, make sure and get the original, not a copy. When we design a roll cage kit we 3D engineer it and put it through stress modeling to make sure that we are offering the safest product possible. Other peoples version of "design" is welding tubes together in a shop. If your cage manufacturer does not have 3D images of the cage, then they have not done the stress modeling. This should be a big sign as to the quality and amount of engineering that has gone into the product. Take advantage of our Spring shipping special. $100.00 shipping anywhere in the continental US. The roll cage kit price is $1175.00 and my shipping cost is $175.00 for a package this size and weight. This is a $75.00 savings..... $1275.00 shipped to your door! The roll cage typically ships within 48 hours of order placement. 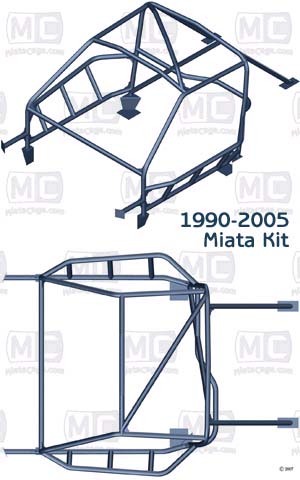 The MiataCage.com custom roll cage kit consists of roughly 69 feet and 24 pieces of 1 ½ by .095 DOM Tubing. The kit weighs roughly 100 lbs once installed in the vehicle and when installed properly is approved for SCCA, NASA, ICSCC and other sanctioning bodies competition. We do offer a Lemons .120 wall legal cage kit as well. We are now on version 4.5 of the roll cage kit. The big change for V4 of the kit is that we have now made the front landing perches out of round tubing that is laser cut to precisely fit the rocker panel with no grinding or modifying in any way! This saves time on installation (roughly 1 hour) and eliminates and sharp edges near the drivers ankle. We have also now included a kill switch plate that is laser cut to fit on the passenger side of the roll cage kit. We continue to make minor changes to help improve the product. Click here to see the version 4 improvements. Lightweight weld in kit. Approximately 100lbs. Landing perches, 14 gussets, kill switch plate and all landing plates included. Partially notched - 11 of the tubes are pre-notched. Computer controlled bending insuring accurate bends every time. Comes complete with 29 page installation guide with over 55 pictures. Every piece is marked with a part # that corresponds to the installation guide and 4 separate full page schematics within the guide. 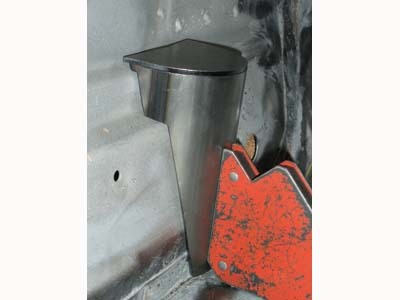 Front down tubes are located behind the dash to allow for easier egress from the vehicle. Main hoop gets installed to perches on the floor that connect the rocker panel, floor and rear tub of the car not to the upper package tray. Rear down tubes land next to the shock mounts. When installed properly less than 1/4" of clearance to roof allowing for more head room for taller drivers. Allows for stock passenger seat to be re-installed once complete. Includes concealed dash bar up high in the car where the drivers legs can't ever come in contact with it. Notice we did not call it a "knee bar". After complete installation dash is still removable in one piece. Includes tubes and plates that connect the front down tubes to the firewall. Additional tubes available ($40.00) to X brace the rear down tubes. Nascar bars on both sides of the cage kit. The only round perch in the industry! New in Version 4. Click here to see what you get when you order a MiataCage.Com custom roll cage kit. Click here for pictures of the roll cage kit installed. Click Here to read a first time cage installer comments and pictures. Discounts for quantities and cash are available - Call for details. We now have .120 Wall Lemons legal roll cage kits. Call for details!